Classic Pianos of Washington is proud to be the exclusive Yamaha Dealer for the Seattle, Bellevue, Everett, and Greater King County area. Since 1902 when Yamaha introduced its first Japanese grand piano, Yamaha's reputation has climbed to top international ranking with the 2010 unveiling of its nine-foot CFX – a full concert grand piano characterized by a wide palette of tonal colors and the ability to create the most subtle expressive nuances. The CFX, which replaces Yamaha's acclaimed CFIIIS concert grand, represents 19 years of research and development in the making. It can project over the sound of a symphony orchestra, even in very large halls, or provide elegant accompaniment in solo or chamber music settings. February 25, 2012 was the first time Seattle audiences had a chance to hear Yamaha's new flagship concert grand. In a special performance by two of today's finest classical musicians, concert pianist Olga Kern played the CFX for her Benaroya Hall appearance that featured concert violinist Vladmir Spivakov. Called "a refined and aristocratic artist" by The New York Times, Vladmir Spivakov is considered one of the most talented violinists of his generation. He currently serves as the Artistic Director and Principal Conductor for the National Philharmonic of Russia. Olga Kern is the striking young Russian Gold Medal winner of the 2001 Van Cliburn International Piano Competition. Her performance of the Rachmaninoff Piano Concerto No. 3 made her the first woman to achieve this distinction in over 30 years. The CFX has begun to make its mark on concert stages around the world. Several distinguished pianists have won prestigious competitions playing the CFX, including the Choongang Competition (Korea), the Paderewski Competition (Poland), the Frederic Chopin International Piano Competition (Warsaw), the National Chopin Piano Competition (Miami) and the Hamamatsu International Piano Competition (Japan). 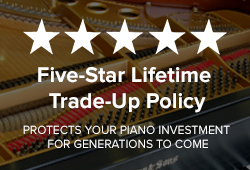 Yamaha pianos are preferred by top American and international pianists, and are selected for some of the world’s most prestigious concert halls, music conservatories, international piano competitions, recording sessions, and music festivals — Classical, Jazz, and Contemporary venues. 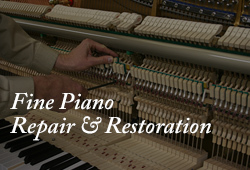 Classic Pianos of Washington proudly showcases all Yamaha models from 5' baby grands to semi-and-full-sized concert instruments. 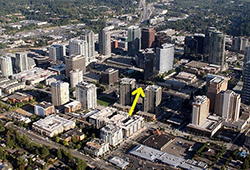 The Greater Seattle area has climbed to national ranking for its Seattle Symphony Orchestra, Seattle Chamber Music Society, Seattle Piano International, Gallery Concerts, University of Washington School of Music concerts and piano recitals, as well as for hosting some of the most prestigious music festivals in America where classical and jazz pianists appear in concert. 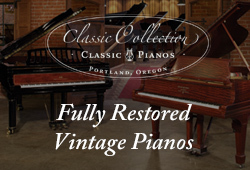 Classic Pianos of Washington continues to support these outstanding music and arts organizations by providing pianos, and through paid sponsorship of advertising in Seattle area programs. Canadian pianist Glenn Gould's legendary 1955 rendition of Bach's Goldberg Variations was recorded on a Yamaha of his selection and preference. Today, a growing number of top-ranked pianists who have been exclusive to Steinway or Baldwin in the past, for example, are playing Yamaha instruments in recordings and concerts. When it came time for renowned musical artist and piano educator Jerome Rose to launch the 12th season of the International Keyboard Institute and Festival (IKIF), held at New York's prestigious Mannes College, he selected the new CFX Yamaha concert grand piano over pianos by two competitors. Guest artist faculty at IKIF included distinguished pianists Joaquín Achúcarro and Akiko Ebi, as well as Yamaha Artists Alexander Kobrin and Olga Kern, all of whom gave master classes and performed in recitals in the Masters Series. Since 1999 the Festival has attracted students from around the world to study with Faculty Artists, participate in master classes and attend concerts and lectures given by some of the world's best-known pianists and scholars. Classic Pianos received Yamaha Corporation's Top Dealer Award for the United States at a gala dinner held in Anaheim, California during the 2012 convention of the National Association of Music Merchants (NAMM).